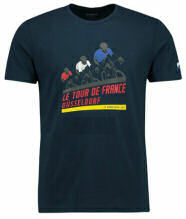 Le Tour de France: the greatest show on Earth! la Vuelta a España, 2016 - let's climb! The Tour de France 2017, Russian mountains on steroids! 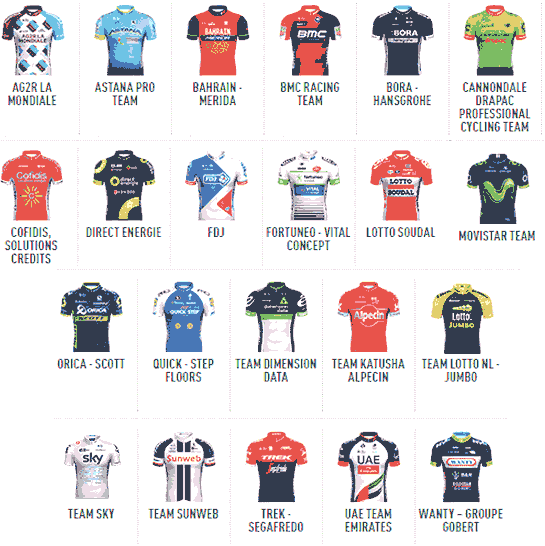 The Tour de France, 2015, an austerity race? Les montagnes russes is the French for a roller coaster. This year's Tour de France is so extreme in the climbs and endurance required, that in the French mountains are rolling on steroids! 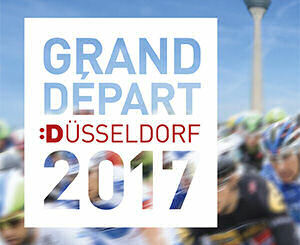 With the Grand Départ opening in Dusseldorf, Germany, this year's Tour de France starts with an individual time-trial (ITT) running along both banks of the River Rhine. 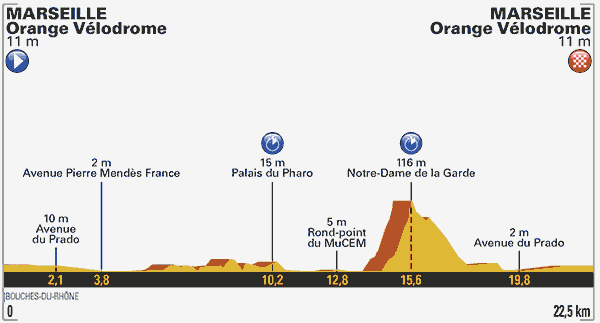 The second ITT is in Marseilles (stage 20) , starting and ending in the legendary (Orange) Vélodrome football stadium, the route punctuated by a climb up to the Notre-Dame-de-la-Garde cathedral. 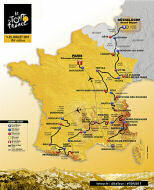 The 104th Tour de France visits three neighbouring countries, Germany, Belgium and Luxemburg, and 34 départements in France. For the first time since 1992, the Tour will visit the five main mountain ranges of France: the Vosges, the Jura, the Pyrenees, the Massif Central and the Alps. 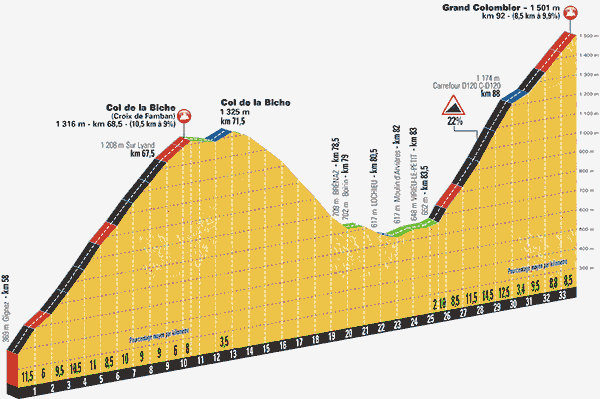 This includes the first ever stage finish at the top of the Col d’Izoard on stage 18. 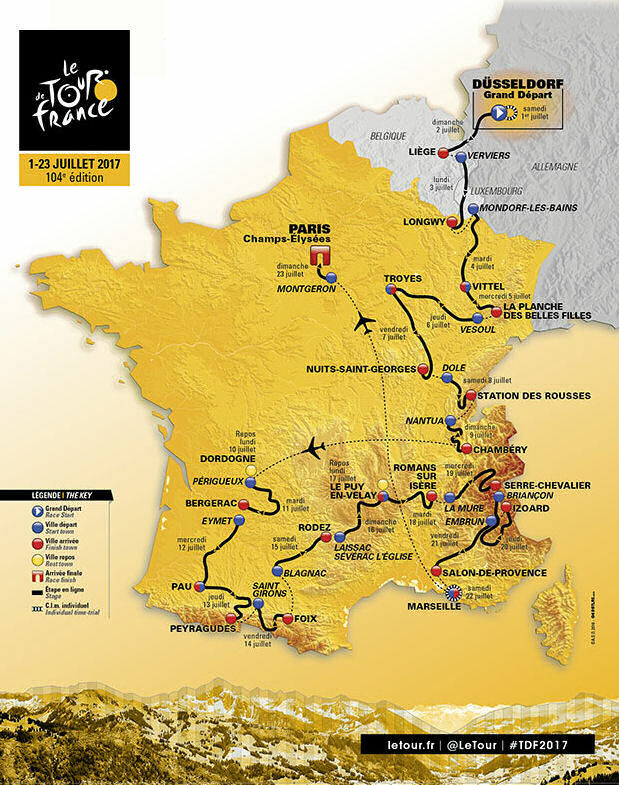 From Saturday 1st July to Sunday 23rd July, 2017, the 104th Tour de France will be raced during 21 stages, over a distance of 3,540 kilometres. The 2017 Tour de France includes a total of 23 mountain and hill climbs, and altitude finishes ranked in second, first or HC class. There is also a special treat for lovers of French history and culture: stage 12. On the 12th July, before the six categorised climbs, the peleton passes through the rich vein that is the region of Bas Armagnac in the east of the département of Les Landes. The race rides through the fortified town of La Bastide d'Armagnac and passes by the very special Chapelle de Notre-Dame des Cyclistes. 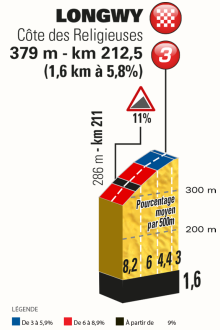 There is also an intermediate sprint at Aire-sur-Adour. Reintroduced in 2015, time bonuses will be awarded at the finish of 'normal', flat, stages. These bonuses are 10, 6 and 4 seconds for the first three in each stage. The points system is said to add value to the stage wins, and to encourage more competition earlier on in the race. Points are awarded both for intermediate sprints during a stage, and at the stage finish of every 'normal' stage. The green jersey is awarded to the leader of the points classification. These points will be given out at the finishes of each stage as well as on the unique intermediate sprints of normal stages. Izoard (stage 18, 2360 m). There will be 21 stages. 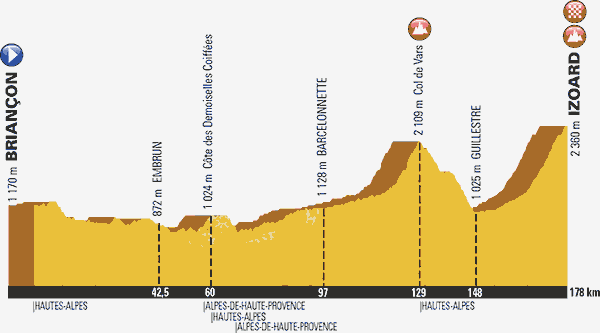 These include 5 high mountain stages, 5 medium mountain/hilly stages, and two individual against-the-clock (stages 13 and 18) [contre-le-montre] time trials. There are 2 rest days (10th and 17th July). All other days are 'on the plain' - relatively flat days, almost touring through some of France. The total distance ridden will be about 3,540 kilometres, or roughly 2,200 miles. 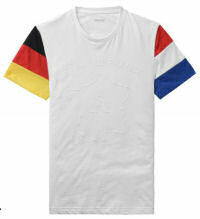 Continuing the trend to play safe, the souvenir t-shirts for this year are very tame. Here's a few. 31 y.o. Winner of 2016, 2015 and 2013 TDFs, 2nd in 2012 TDF, bronze medal in 2012 Olympics time trial, 4th in 2012 Vuelta. His 1m 83/6ft 2 ins contributes to being a strong climber and time-trialer. 13/8 BMC AUS 32 y.o. Until this year, acting as Chris Froome's 'bag man' in Team Sky. With changing teams, Richie Porte is showing his real capabilities. He has exceptionally strong climbing legs - essential in this year's TDF. 3 Nairo QUINTANA 13/2 MOV COL 27 y.o. Winner 2014 Giro and best young rider (White Jersey). Runner up to Froome in 2013 and 2015 TDF. Althugh his slight build makes Quintana a natural climber, he has not shown great stamina so far this year. 4 Alberto CONTADOR 14/1 TST ESP 34 y.o. Won 2012 Vuelta. Stripped of 2010 TDF and 2011 Giro titles for doping. Refusing to admit his glory days are over, Contador persists and persists and persists, wanting still to win the TDF again. Realistically, Contador doesn't have a chance. Winner 2015 Vuelta and 2nd in 2015 Giro, 6th in 2016 TDF. Injured, Aru did noot cycling in the 2017 Giro. 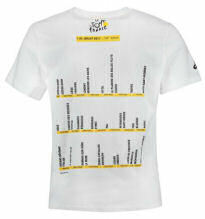 Another strong climber, as required in this year's TDF. 6 Jakob FUGLSANG 16/1 AST DAN 32 y.o. Won 2017 Critérium de Dauphiné, including two stage wins - stage 8 beating Chris Froome and Richie Porte. Won silver in 2016 Olympic road race. 7 Alexandro VALVERDE 17/1 MOV ESP 37 y.o. 4th in 2014 TDF, 3rd in 2015 TDF, 6th in 2016 TDF, 3rd in 2016 Giro. Returned to racing in 2012 after 2-year suspension for doping. Nickname: El Bala (The Bullet). 8 Romain BARDET 22/1 ALM FRA 26 y.o. 2nd in 2016 TDF, being only the 6th Frenchman to make the TDF podium. 9 Geraint THOMAS 33/1 SKY GBR (Wales) 31 y.o. 1st 2016 Paris-Nice (by 4 seconds against Contador), 1st 2017 Tour of the Alps (Giro del Trentino); withdrew from 2017 Giro, injured. 10 Louis MEINTES 66/1 UEA AFS 25 y.o. 8th in 2016 TDF, 8th in 2017 Critérium de Dauphiné, 6th in 2017 Tour of the Basque Country. Position No. Name First name Team Nat. Time diff. 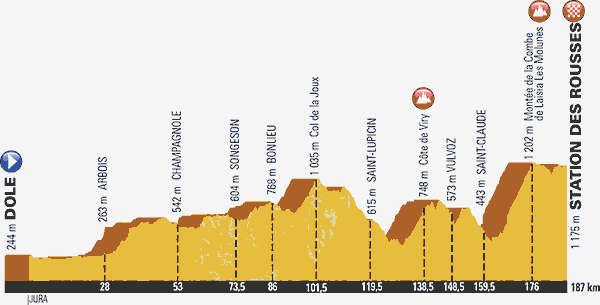 1 1 FROOME Chris SKY GBR 89h 04' 48"
2 41 BARDET Romain AGR FRA + 4' 05"
ORS GBR 89h 09' 30"
At the end of this flat stage there is a sudden short, sharp shock of a 1.6 km climb. While the average gradient is 5.8%, there is an intermediate portion at 11% , ready to challenge and maybe surprise at the end of this fast stage. Starting with relatively minor climbs, this stage builds in difficulty with an intermediate sprint at the start of the Category 3 climb. The race's end is a gruelling Category 1 climb, emphasised by a near-impossible 20% gradient last kilometre. 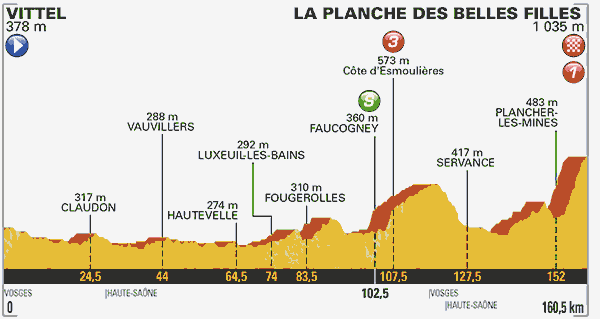 After two introductory category 3 and 2 climbs comes the 11.7 kilometre-long climb to the summit of la Combe de Laisia-Les Molunes (1 202 m). This ascent averages 6.4%, before an undulating 11 km to the stage finish. 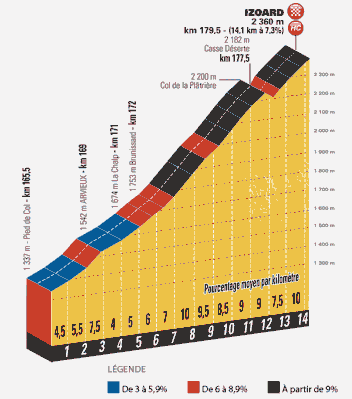 A grinding day of seven categorised climbs, including three Hors catégorie climbs. 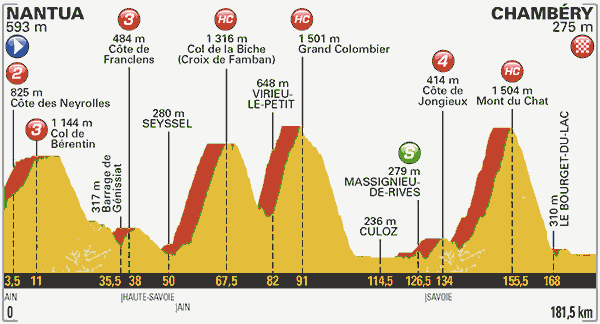 The second - up le Grand Colombier - has 3 km of a gravity-defying 22% gradient amongst the 8.5 km ascent averaging 9.9%. 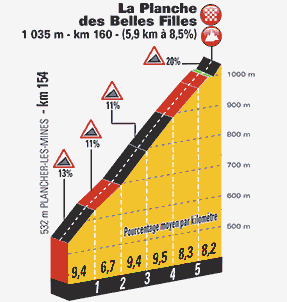 Another gruelling day of six categorised climbs- it's les montagnes russes (a rollercoaster) on steroids. 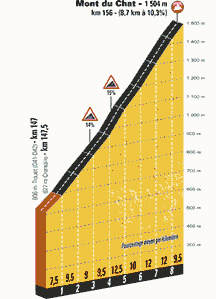 Km 214.5 - PEYRAGUDES (1,580 m): 2.4 kilometre-long climb at 8.4% - category 2. A surprisingly hard day, with another crescendo of difficulty and stamina demands. 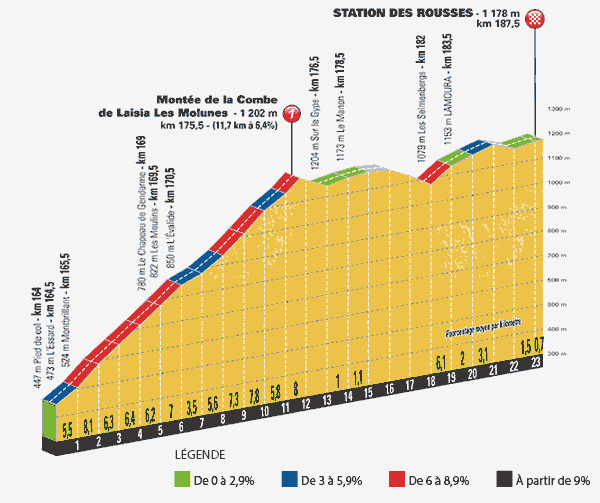 First, the category 3 Côte des Demoiselles Coiffées, a 3.9 kilometre-long climb at 5.2%. 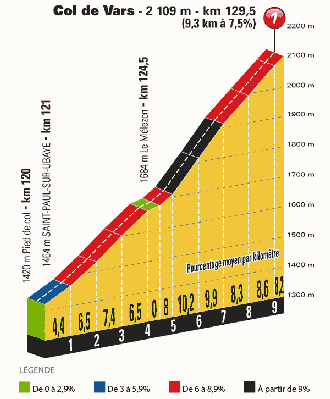 Then up to the 2,109 m category 1 Col de Vars, with its 9.3 km climb at 7.5%. 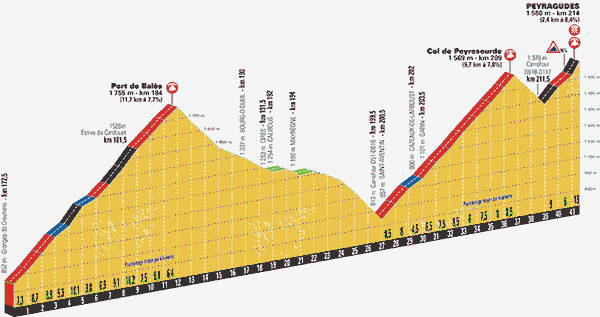 The climax of today's cycling performance is the 14.1 km climb up to the 2,360 m summit of the Col d'Izoard. This Hors Categorie climb averages 9%, with three sections of 9.5%, 9%, and 10%. The second individual time trial starts and ends at the famous Vélodome football stadium, recently renamed for its new sponsors. Added to the fierce drum of cycling agaiinst the clock is the sharp climb up to Marseille's cathedral, Notre Dame de la Garde. We will provide this information when it is available, closer to the race start.